As I was reading all sorts of news about East Turkestan, I remembered my travels to the southern areas in the autumn of 2003: Turpan, Keriye, Khotan, Karakash, Qaaghiliq, Yeken, Yengisar, Kashgar, Maralbeshi, Bay, Kuchar, Chaqiliq… All these Uyghur names are unforgettable. From the photos that I took back then, the most unforgettable ones are those showing the beautiful children in the old town of Kashgar. These boys and girls have all grown into young adults, but are they well? The picture shows me with the children, it was taken by Wang Lixiong. 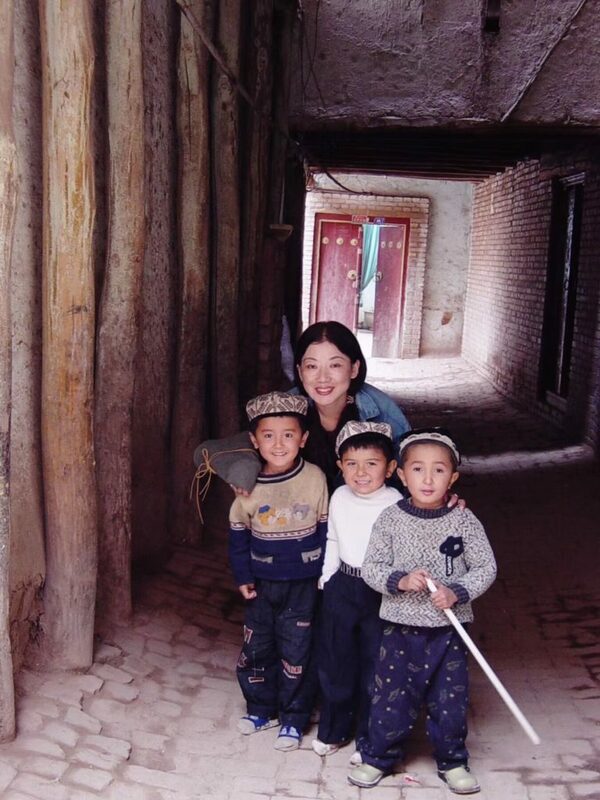 In this piece, Woeser remembers her travels through East Turkestan (Xinjiang Uyghur Autonomous Region in Chinese) in 2003 but, as she alludes to, the situation there has acutely worsened since. In particular, details started to emerge earlier this year about the network of Reeducation Camps set up in the region. The work of scholars, human rights organisations and journalists have uncovered hard evidence of the expansion of the camps and mistreatment of Uyghurs all under the tight grip of Party Secretary Chen Quanguo – relocated from his post as Party Secretary of Tibet Autonomous Region. Woeser’s husband Wang Lixiong has been a close watcher of East Turkestan for almost 20 years and in 2007 published a book titled “My West China, Your East Turkestan”, read an extract from that book in English on China Change here. The last paragraph of the article refers to Woeser’s own short story Nyima Tsering’s Tears that was published in her book “Notes on Tibet”. Finally, for unfolding information about the current situation in East Turkestan, follow on Twitter (among others) Adrian Zenz, James Leibold, Rian Thum and Darren Byler. Many memories are scattered across the series of articles titled “East Turkestan Through the Eyes of a Tibetan” that I wrote 15 years ago. But many memories are fragmented. Back then, I took photos and notes along the whole journey. It was only a 13-day-long trip but I managed to visit most of the places in the south, also known as Nanjiang (South Xinjiang): Turpan, Keriye, Khotan, Karakash, Qaaghiliq, Yeken, Yengisar, Kashgar, Maralbeshi, Bay, Kuchar, Chaqiliq… All these Uyghur names are unforgettable. But my records are not complete, or rather, I had only written half before there is an abrupt end. Originally, I thought I would later come back and add to what I have. I wanted to especially go to the places I had not been to, like Urumqi and other areas in the north. I never thought that my first trip to East Turkestan in 2003 would very likely also be my last. And this is not because I myself would not be able to go. It is because of the developments in East Turkestan. In 2009, after Wang Lixiong published his book “My West China; Your East Turkestan”, he always wanted to take me there again but our friends there always advised us not to, saying that recent developments are not good, to wait and see later. So we waited until today. And it is all too well-known that nothing has been changing for the better; on the contrary, things are getting even worse. We haven’t heard anything from our friends in a very long time. And so, when I went back to the series I wrote about my travels through East Turkestan for Radio Free Asia, I also especially dug out the published photos that I had taken of Uyghur children in Kashgar. I looked at each one of them and felt anxious. 15 years ago. These boys and girls have all grown into young adults, but are they well? Have they also been evicted and subjected to the fate of old Kashgar that was “modernised”? All I can do, being so far away from them and their world, is to harbour empty worries. A few days ago, when German media wanted to interview Wang Lixiong about East Turkestan, he had to regretfully tell them that he had not been back for 12 years and that, being so closed off, it was impossible to really know anything about the current situation in East Turkestan and that it would be irresponsible to prematurely comment on it. “… ‘Notes on Tibet’ is an anthology of Woeser’s prose writing, which was first published in 2003 by Huacheng Publishing House in Guangzhou. While the book was popular, and soon went into a second print run, it also attracted the attention of the censors. At first, the United Front Department of the Chinese Communist Party considered the book to have made ‘serious political mistakes.’ This accusation was followed by the demand from those in charge of ideological work in Tibet to examine the book. At the same time, its sale in the TAR was banned. Finally, the Bureau of Journalism and Publication of Guangdong Province was ordered to completely ban the book. “…Until now, Woeser has been punished: 1. In the name of voluntary resignation, she was removed from her post in the TAR Literature Association and deprived of her income. 2. The housing assigned to her has been confiscated; she now stays temporarily with her mother. 3. By the suspension of her medical and retirement insurance she is left with no social security. 4. She is restricted from applying for a passport to leave the country. So, in spite of not being thrown into prison, she has been deprived of everything that can be taken away from her. For people living in free societies or in today’s inland China, the significance of this kind of punishment to Tibetans might not be clearly understood. Society within inland China has now diversified into different options. There are enough opportunities beyond the official system to allow many people to survive and prosper without dependence on the system. 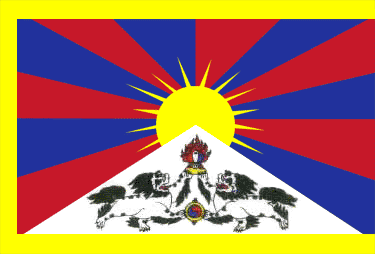 In contrast, the modernising of Tibet and its society has been structured to completely rely financially on Beijing. There is no real social stratification there. With the monastic sector as the sole exception, nearly all other kinds of cultural workers and intellectuals have been entirely recruited into the system. In other words, only when inducted as a part of the system can one have a chance to become a professional working in the fields of culture; otherwise, there is even no guarantee of basic survival.